Why hello, loves! I want to thank you for all of your love, support and best wishes - and I promise wedding photos and recaps are coming very very soon! 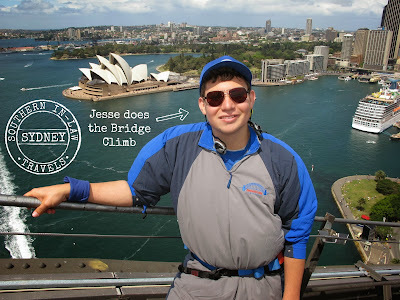 Today, my husband (hehehe) is taking over the blog because he wants to tell you about one of his recent achievements... it's nothing big... you know... just climbing the harbour bridge! But enough yada yada from me - here's Jesse! Hey SIL Readers, I know I don't often take the stage blog post, but seeing as Kristy is scared of heights, my hand shot straight up when we were asked if we wanted to climb the harbour bridge. Wesley, my best man was here too, so we thought it would be the perfect opportunity to see if the Bridge Climb was SIL Approved! Where to begin?! The entire experience was awesome and the anticipation really built as Wesley and I waited for our climb to begin. When you first arrive you pick up your tickets and wait for your group to be called (get there 15 minutes before your climb time!). Then you head into the first room where you sign a waiver and let them know of any medical conditions you might have. In our case, Wesley has asthma so he passed his inhaler onto the climb leader who kept it on him during the climb in case he needed it. If you do have any medical issues, be sure to bring your medication just in case - it's better to be safe than sorry! They also do a breath test to ensure you don't have any alcohol in your system - safety comes first! Getting to Know the Group. After that's all over, we were taken into a second room to meet our climb leader (ours was John who was awesome!). Once we were all in the room we introduced ourselves to our fellow climbers and the climb leader. I loved that we were all on a first name basis - it made everything feel so much more fun and exciting. Kristy note: if you're one of our new readers that Jesse met on the climb, hello!! Then we were passed our very flattering jumpsuits and headed to a dressing room to ensure it fit to our liking before suiting up and leaving all lose items (earrings, watches, phone, wallets) in the lockers. There's actually only one key for the lockers and that goes around your neck while you're on the climb - so you don't have to worry about someone taking your things. Once we were all suited up we headed to the next room where we were shown how to use the harness properly and John checked that every harness was secure. 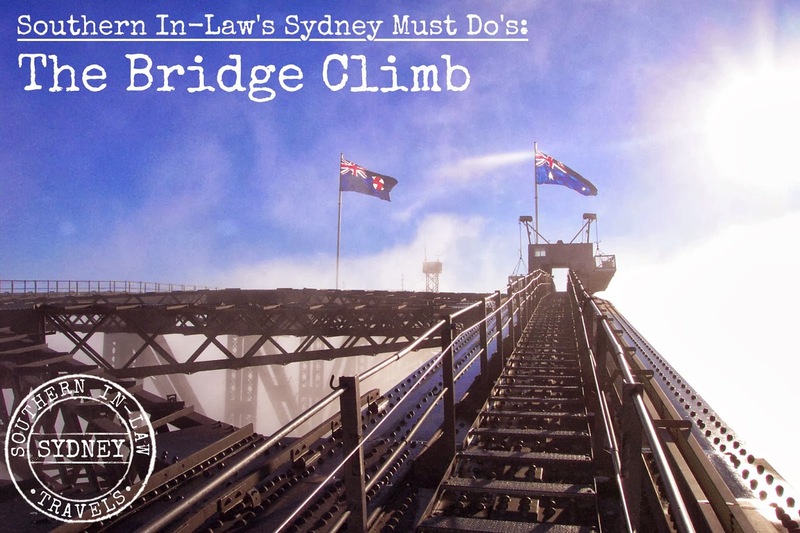 Just so no one finds they can't climb the ladders whilst they're up there, you do a practice run on a couple of ladders inside - this way you know that you'll be comfortable and confident on the bridge. Once we were done, we finished getting ready for the real climb. In addition to the suit, you also get a windbreaker (in case you get cold up on the bridge), safety clamps for your sunglasses/glasses, clips for a hat (which you get to keep! ), a handkerchief - or in Wesley's case two as he said he thought he might be "extra emotional" haha - and a radio so you can hear everyone on top of the bridge! If you're worried about getting too hot - don't be! It's windy up there and the suits have vented side panels - hence why they puff up! The climb starts when you move onto the lower section under the bridge, securing yourself to the safety cable and beginning your ascent! It really was the best experience - we were all laughing and getting to know each other. 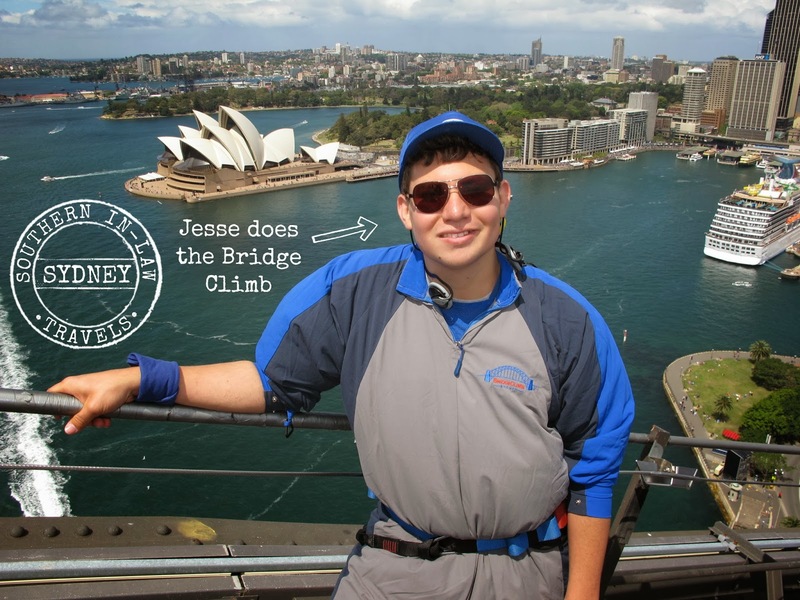 John was a great climb leader and told us all of these interesting facts about the bridge and what we could see. 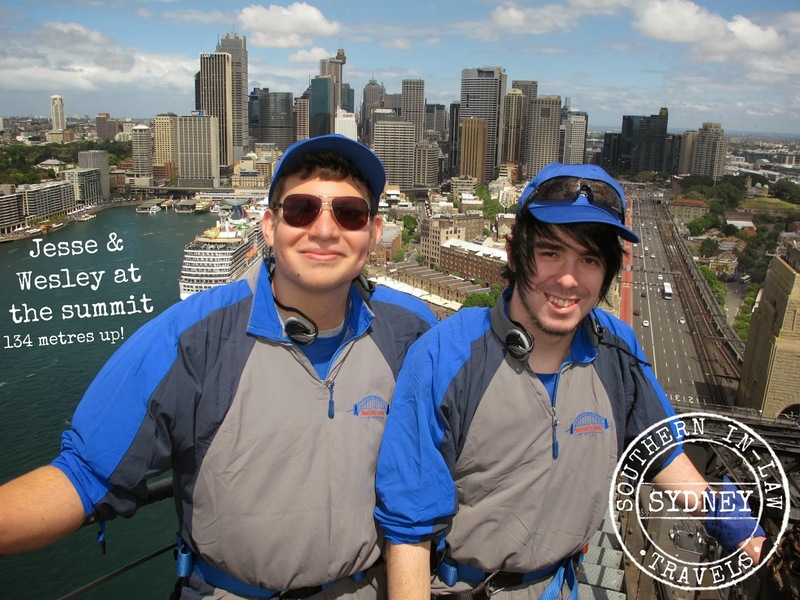 You really want to be in the moment so you don't miss a thing - it's the best view in Sydney and you can see everything. You stop for photos at the bottom of the arch, once you're in front of the Opera House, at the top for a big group photo and one last photo at the summit before you begin your descent. You also get to record a video for your family and friends. This is something I know I'll remember for years and years to come - and I'm already trying to convince Kristy to do it with me! The whole climb took a bit over 3 hours but it was worth every second - the climb leader was fantastic, we felt like part of a team with all of the other climbers and you walk away with a huge beaming smile and sense of achievement. Once you make it back to base, you remove your gear and get your things before having a few more laughs and basking in the accomplishment of something amazing. You then get to see your photos and select which ones you'd like (or all of them!) depending on the package you buy. You can also head to the booth to email your video to yourself or friends. 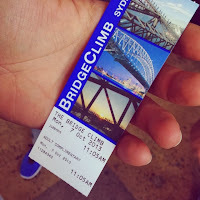 The Bridge Climb is definitely SIL approved - and now I just have to get Ms SIL to do it with me! 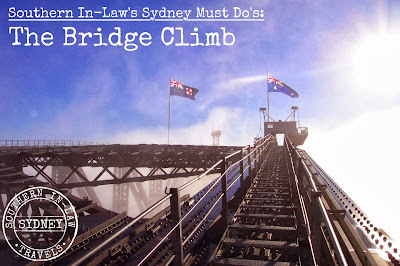 But tell me, would you climb the Sydney Harbour Bridge? Or have you? 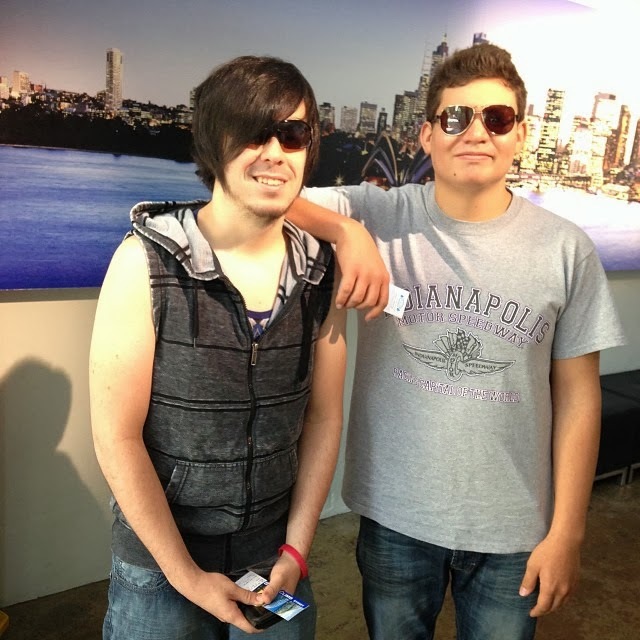 Jesse will be answering all of the comments with me - so be sure to say hello! Kristy and Jesse did receive complimentary tickets for this climb, however, all opinions are their own.